Save money by buying a wheel load scale system as a complete package. System includes 2 platform scales along with totalizing cable. Charger is also included in the system. On top of all that, the carrying case is also a part of the Intercomp Wheel Load Scale System. 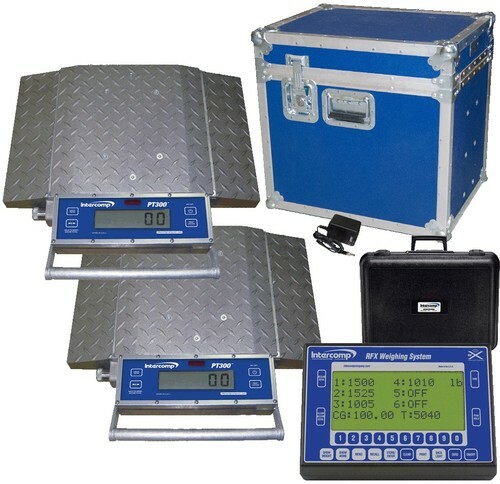 Lead time is usually 2-3 weeks and ships to you freight included for customers in the continental U.S.
Includes: Two scales (12" x 12" platform) with wireless output, handheld wireless weighing indicator with batteries and case, totalizing cable, scale charger and storage case for scale pads. 12" wide platform accommodates single tire (outside tire in dual wheel configuration).Total Capacity: 10,000 x 5 lbs.